The scent of incense from joss sticks smouldering in their bronze holders outside people’s doors, wafts on the morning air down the alleyways. The rooster announces the arrival of a new day while the ding-ding of a nearby bell indicates worship has begun. At the far end of the alley Christmas lights sparkle around a small religious shrine attached to the wall, and a street seller, his old wooden wagon filled with fresh bananas, shouts his wares to the open windows above. An elderly Vietnamese woman sweeps her doorstep with her coconut leaf broom, as a stray cat scurries by in hot pursuit of a lone cockroach dashing for a hidey-hole amongst the concrete walls. Her work done, she sits on the doorstop in the cool morning air waiting for the heat of the day to intrude. She stares uninterested at a small street seller quietly pedalling his wares to a young, male tourist. His sandwich board, filled with sunglasses, lighters and nail clippers pulls down on his thin shoulders, and by night-time he will be stooped from the weight of it. He will be back to do this all again tomorrow. Is this the idyllic setting you imagined? Words are powerful but a picture speaks a thousand of them! rickety gangway, I uneasily eye the filthy brown and polluted water below me, and stepping carefully I take a seat at the back on one the old wooden slatted seats next to the clanking diesel engine. The noise is like sticking your head in a blender filled with marbles, and it is only moments before Roger has his ear-plugs firmly in place – he is always prepared for everything. We arrive at Unicorn Island where we visit a local bee farm and take a traditional rowing boat ride along the coconut canal. Unfortunately, it has been a long time since the area has had any rain and the river is at least a metre below what it should be. 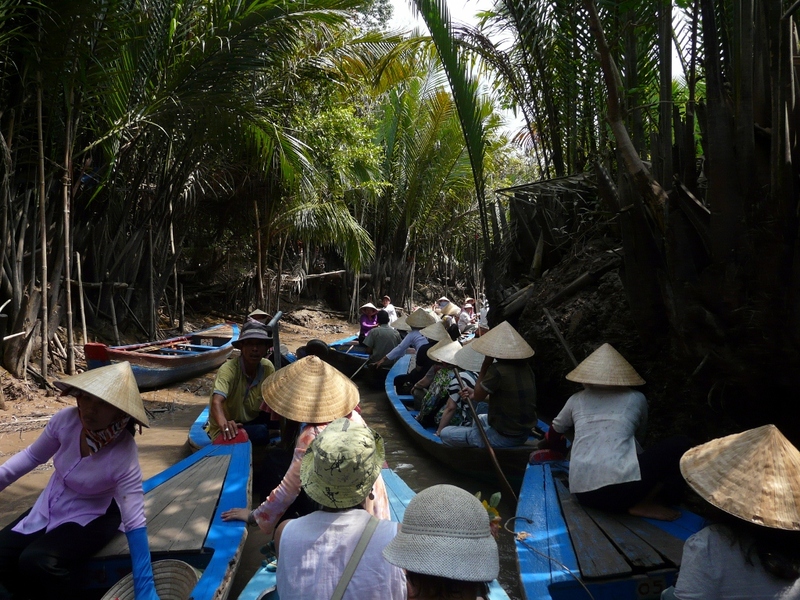 The result is a congestion of about twenty traditional Vietnamese rowing boats all trying to fit at once down a four metre wide canal that is ½ a metre deep. It is complete chaos! Coconut Canal Ride - Just like being amongst the scooters! We are instructed to keep our fingers inside the boats to avoid them being sliced off as we crash consistently into the boat next to us. I again uneasily eye the smelly brown, debris and litter filled canal. About half way down we have a head on collision with a boat travelling back up river. Roger and I grab at the sides of the boat in an attempt to steady it. Two Polish women seated in front of us chatter furiously “Gushta pushta mushta” (or something like that!). They seem as nervous as we are! 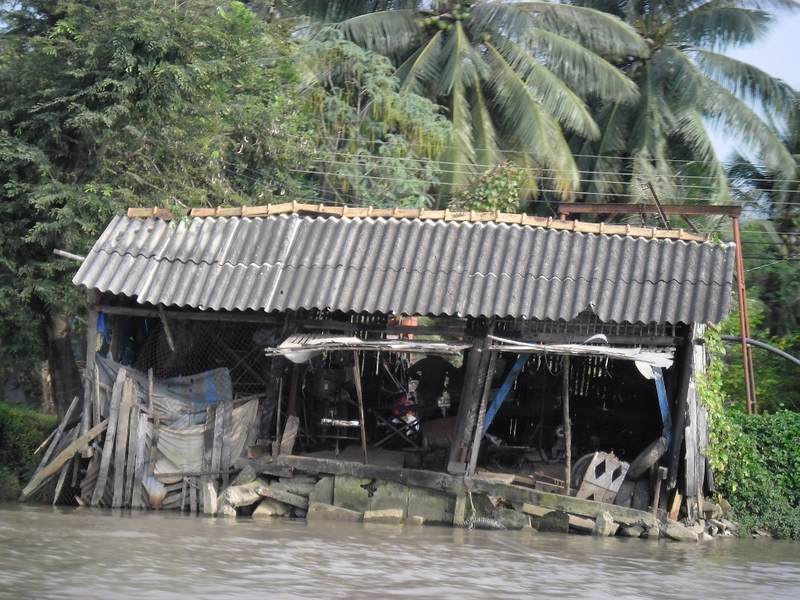 We are filled with sympathy for our canal riverboat guide as he smiles and proudly points out his home to us – a tiny run-down bamboo shack on the side of the river where he, his wife and their three babies live. Shortly after this he taps Roger on the shoulder and rubs his fingers together – international sign language would suggest he is after money. “Another bloody ploy,” mutters Roger, “he probably doesn’t even live there.” We give him a tip nonetheless. At Ben Tre we visit a handmade coconut candy workshop and enjoy a sample of tropical fruits while listening to Southern traditional music. 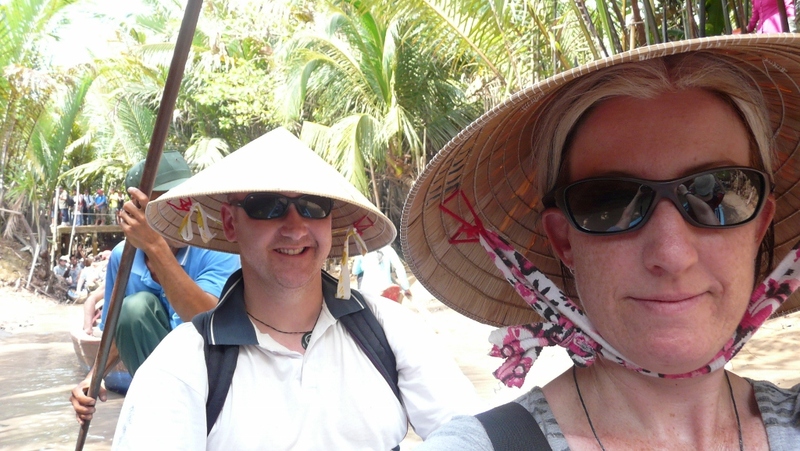 As our tour comes to an end we board a speedboat back to Saigon. 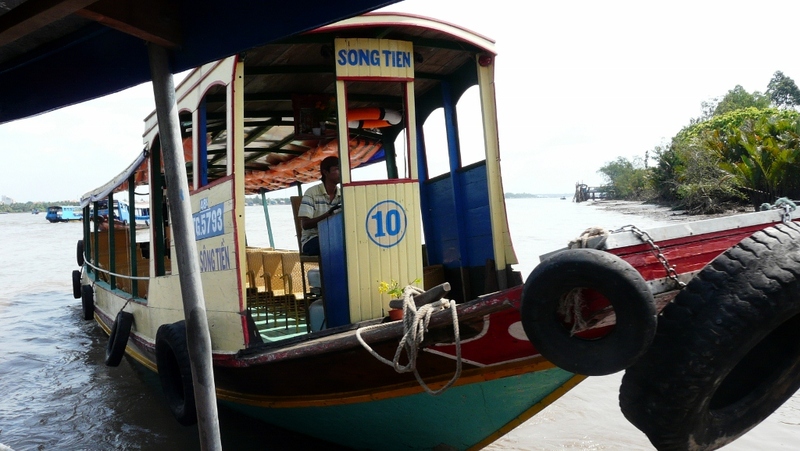 It only holds fifteen people but a bulshy and self-important Polish tourist has bribed the driver to get him back to Saigon faster than the bus he should be on, and as him and his four companions climb on board, the boat sinks unsettling low in the water. Once more I uneasily eye the filthy river splashing up around the side of the boat as we fly down the Mekong River, past houseboats, peasants washing their dishes on the shore and barges transporting huge piles of soil. 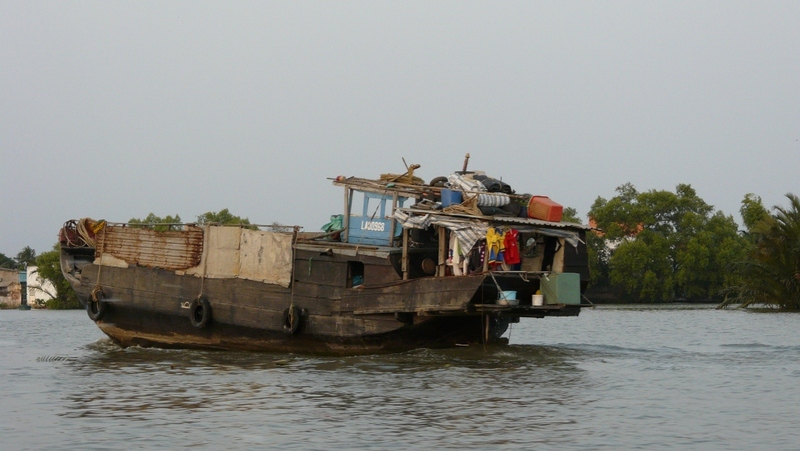 A peasant's home on the edge of the Mekong River - open plan, double garage and air-conditioned with colour steel roof. Just as we begin to relax into the ride, the speedboat veers sharply to the right and the nose dips down quickly. Brown murky water floods along the sides of the boat. The engine has cut out and we are adrift in the middle of the mighty Mekong. Roger and I glance anxiously at each other – what the hell is going on? The driver restarts the engine and reverses the boat slowly backwards. We turn away from a large clump of floating bamboo sticks and tree debris, and before long we are roaring up the river again. 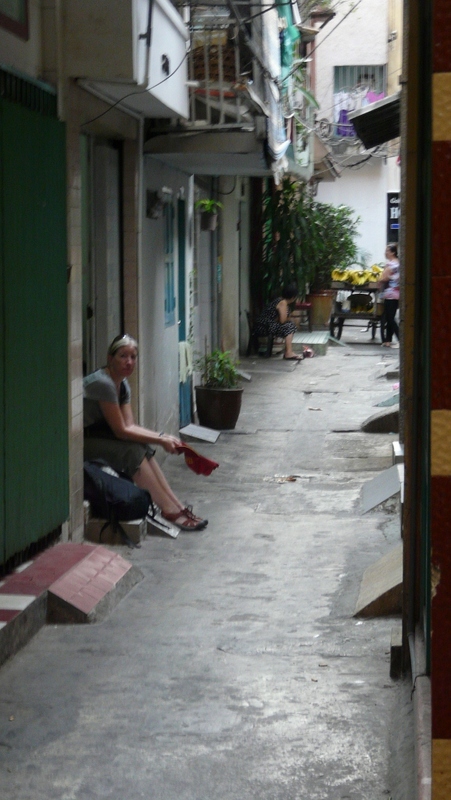 We arrive back at our hostel in the alleyway. The same old Vietnamese woman still sits on her doorstep, only now it is dinner time and she is cooking a fish on a small coal brazier fire outside her door. We are fondly hugged by our host again before climbing the steps to our room to a welcome shower, where we wash the mucky Mekong away down the plughole. Tomorrow we leave for Bangkok, Thailand.